When Static Stretches Stop Working. My sister introduced me to the term barbell yoga. I think it is a pretty good term that relates to the idea of increasing range of motion within the area of weightlifting. What I think can be gained from yoga is the idea of maintaining a static stretch position in an isometrically contracted posture. In college I was introduced to the concept of cardinal planes of movement (sagittal, frontal, and transverse). In algebra Descartes helped express these planes in X,Y, and Z . All that being said there is a sort of symmetry that is promoted and in athletic movement patterns. In yoga there are poses called the warrior pose along with Anjaneyasana, in Karate there is Zenkutsu Daschi in weightlifting there is the lift called the split jerk, a less dynamic movement called the split squat along with variations of lunges. Each of these types of movements promote hip flexor range of motion. All of these similar patterns create muscular integrity at length or within the end range of motion of the hip flexor. In weightlifting an isometric hold would be added to demonstrate the length to the target muscle along with demonstrating postural length globally. A time frame of 1-5 second would suffice when using a weight. 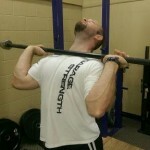 In addition to strengthening the body in the position a certain amount of muscular endurance can be gained. Acquiring strength at length can help to maintain the postural integrity along with relieving minor issues provided an individual works to correct and balance both sides. In conclusion opening a range of motion through static stretching can help provide range, but will likely not sustain it. However training a range of motion provides the best of both worlds. A special thanks to Coach Banda for allowing me to use his archive of videos. Why weakening a muscle prior to an exercise can make you stronger. Back in the day static stretching was all the rage even today students of many skills feel like they need to stretch prior to engaging in activities. The reasoning is I don’t want to pull a muscle. However contrary to popular belief there is plenty of research to demonstrate that static stretching can be deleterious to performance. (1)(2) However in certain instances static stretching is warranted provided that it is the antagonist and not the agonist you are stretching. In the case that and individuals hipflexor is tight due to sitting all day it is a good idea to stretch during warm up of the squat, intra set. This is related to the reciprocal inhibition. (3) What happens is by stretching antagonist muscle group say the bicep you can more easily contract the agonist muscle the tricep. Incorporating any of the above stretches can add to the mobility of the squat however it is important to understand that stretching a muscle for example the hamstring prior to a deadlift would be a grave mistake. 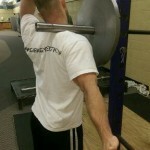 (1)(2) This is one way to address mobility without compromising strength or power. 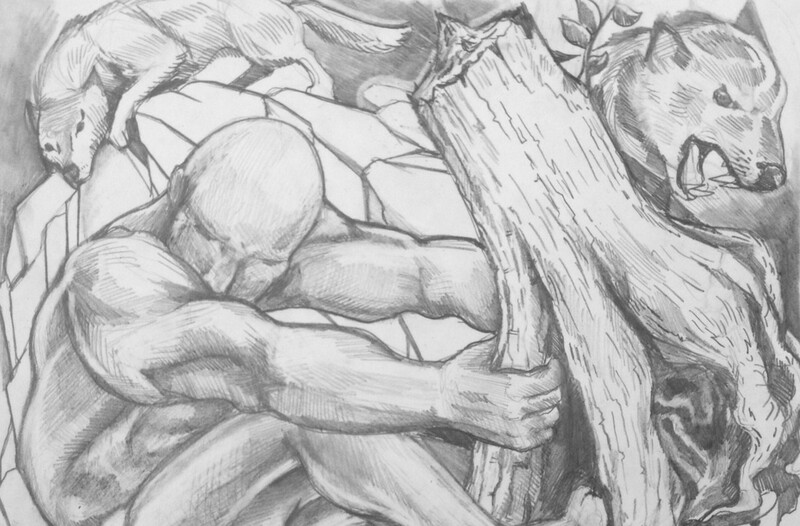 The story of Milos of Croton is often presented as the story of progressive overload. Milos carried a calf into town everyday and as his burden grew so did he. Milos had the foresight to burden himself at a young age to reap his reward later of becoming a champion grappler. This is where the story often ends. However legend tells that Milos met his fate trying to rent a stump in two with his bear hands and was killed by a pack of wolves when his fingers were stuck. What the story doesn’t tell you is why Milos went out of his way to tear stumps in half. Was it pride, leisure, or boredom. My suggestion is Milos was doing rehab. As Milos went on in his years as a grappler he developed the chronic protracted stance of a wrestler. Due to the kyphotic nature of the sport Milos had slopped shoulders and underdeveloped rear delts along with upwardly rotated and winging scapula. Milos was using the stumps to correct his imbalances and pull his shoulders back into alignment. Somewhere along his journey he was having shoulder trouble and either an older grappler told him the how to correct it by tearing stumps apart. Perhaps he stumbled on it by accident and realized that it made him asymptomatic. Either way I think he was doing rehab but sadly that fateful day he bit off more than he could chew. The three stretches below are a good way to open up internal rotation tightness between sets of overhead squat as part of the warm up. 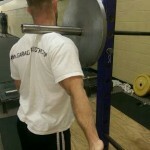 Moving from an empty bar and gradually ramping to working weight for the overhead squat. If this is your first time doing the overhead squat be advised that without a foundation of upper body strength a broomstick would likely be your best option for the first couple of weeks slowly progressing to heavier bars until the shoulders and sustain the load of a Olympic bar. Each stretch should be comfortable to the shoulder. In addition to the stretches some soft tissue work can also compliment at tight upper trap and supraspinatus. It is a common tender point. 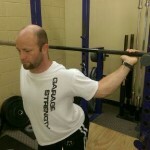 The final part of overhead squat warm up would be overhead squats emphasizing pause in the bottom position. Not all people can demonstrate the mobility to go to the hole there first attempt/workout. And grip width will be harder the narrower you go. First set start wide and each additional set attempt to go narrower without compromising form of the overhead squat. 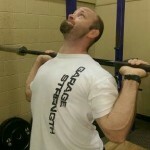 There are various other techniques and stratagem to get the upperbody in postion for the overhead squat. This is only one of them. My recommendation is to do this warmup a minimum of 3 times a week.